There are two signs on Hope Kramer’s office window at the Oconomowoc Public Library. 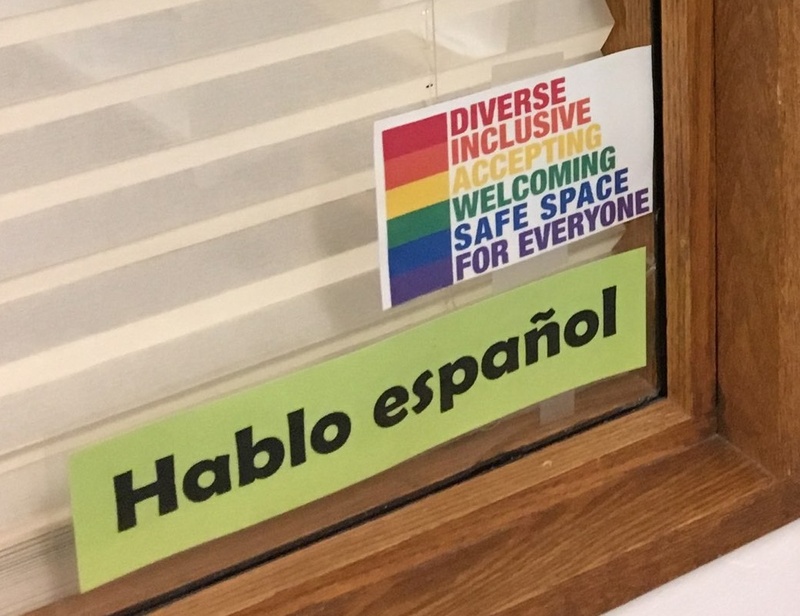 One reads “Diverse, Inclusive, Accepting, Welcoming, Safe Space for Everyone.” Another says, “Hablo español.” Hope is the Head of Reference, Adult Services, & Cataloging at the library. She helps library patrons with a variety of research and technical needs, plans programs for adults, and orders materials for the library’s collection. She also assists Spanish-speakers who come into the library with translation needs. Hope, who speaks Spanish at a high intermediate level, is one of two library staff members at the Oconomowoc Public Library who offers language translation assistance. (The other staff member translates for German-speaking patrons). Among other tasks, Hope has assisted individuals and families in everything from applying for library cards, to purchasing airline tickets, to providing basic translation for school forms. In this capacity, Hope focuses on showing and explaining how to do something, rather than doing the task for the patron. Why does this matter? Because libraries, almost more than any other American institution, is built on the principle that everyone is welcome. As it states in the Library Bill of Rights, adopted by the American Library Association, “A person’s right to use a library should not be denied or abridged because of origin, age, background, or views.” One aspect of that is straddling the language barrier. In the last 15 years, the Hispanic population in Wisconsin has increased 95%. Though many families are bilingual, there is still a need to offer materials and services in more than one language. Waukesha and Jefferson County libraries are responding by offering collections in Spanish of popular books, movies, CDs, and more for adults, children, and teens; bilingual marketing materials, library forms, and storytimes are other creative solutions libraries across the country are implementing to be more inclusive. Like Hope, library staff members are a crucial part of bridging language gap. For example, the Waukesha Public Library offers Spanish assistance and have staff members who speak Hindi and French. Elm Grove Public Library has a staff member who speaks Spanish, while a staff member at Menomonee Falls Public Library translates for Serbian-speaking patrons. A version of this article appeared in the Waukesha Freeman, the Oconomowoc Enterprise, the Daily Jefferson County Union, and the Watertown Times. We will be sharing those pieces here on our website a few weeks after each piece has been printed.